Saskatchewan Power Corporation building, Regina, combines local materials and colours such as a wheat-coloured brick from Estevan with a gently curved plan inspired by Brazilian modernism. Saskatchewan architecture is a reflection of a short and compressed period of European and American settlement, preceded by a long history of First Nations settlement and quickly followed by participation in a global economy. Local First Nations did not possess a tradition of permanent construction; there is, however, evidence of semi-permanent structures such as the conical log dwelling of the northern Cree. The tipi (a Siouan word) has become an iconic representation of a temporary form of shelter on the Prairies which utilized materials at hand: poles and bison skins. As the investigation of First Nations' past advances, more constructions are being discovered: stone circles, effigies and mounds, the meaning of which is open to debate, continue to survive and are studied from an archaeological rather than an architectural viewpoint. These constructions are often found on high ground, and oral traditions suggest that they may have been used as ceremonial places, or as orientation devices for travelers crossing the vast prairie. Wanuskewin, near Saskatoon, preserves an example of First Nations settlement and one of the earliest known subterranean dwellings in the province. The name of the Assiniboine Nation translates to “Stony Sioux” in Saulteaux (Plains Ojibwa), in recognition of their frequent use of and reverence for this material. Fur traders and settlers brought with them building traditions imported from many places, but transformed them with construction techniques that depended on the availability of materials and expertise. Holy Trinity Anglican Church at Stanley Mission is the oldest standing building in the province, built between 1854 and 1860 utilizing a heavy timber structural frame constructed onsite, combined with stained glass windows, locks and hinges imported from England and floated down the Churchill River. In 1882, the arrival of the transcontinental railway caused the flow of European settlers to accelerate. Battleford, Prince Albert and Fort Qu'Appelle, settlements during the pre-railway territorial period, were comprised of modest wood-frame, log or stone buildings exemplified by the Hudson's Bay Store in Fort Qu'Appelle (1897) and Government House in Battleford (1877; lost to fire in June 2003). Grain Elevators, developed in the 1880s as a solution for quickly loading grain onto railway cars and benefiting from the new technologies of “cribbed” wood construction and elevating devices, are viewed as one of the first modern building types. The town of Fleming is home to the oldest standing grain elevator in Canada, dating from 1895. With the creation of Saskatchewan as a province in 1905, there was unbounded optimism for the future. The Legislative Building (Regina), the University of Saskatchewan (Saskatoon), the Provincial Hospital (North Battleford), and the correctional facility (Prince Albert) were then built, along with courthouses and land titles buildings throughout the province. These buildings employed substantial materials like brick and stone, and were designed by professional architects in a variety of styles (see Architectural Influence): Gothic, French Classicism and Georgian Classicism are examples of many “revival“ styles popular at the time. The Capitol Theatres in Regina and Saskatoon, and the Towne Cinema in Saskatoon displayed lavishly decorated interiors known as “atmospheric,” usually in a Spanish style. Building materials included Tyndall stone (a fossilized limestone from Manitoba), local fieldstone, and brick from over 100 small brick-making facilities or from one of the three major plants located at Estevan, Claybank and Bruno. The Regina architectural firm Storey and Van Egmond designed many early buildings. From 1915 to 1929, provincial architect Maurice Sharon designed courthouses and hospitals in the American Colonial style. 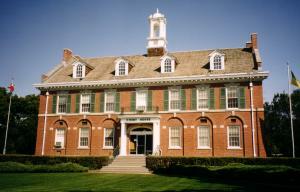 A Weyburn landmark is the 1928 court house designed by Provincial Architect Maurice Sharon. Built in a distinctive Colonial Revival style, it expressed the confident aspirations of Weyburn in the last good harvest year before the Great Depression. With the coming of the Depression in 1929, building activity slowed dramatically but the projects that were realized, mainly service stations, airports and radio stations, were built in a new style called Art Moderne, characterized by streamlined forms rendered in stucco. World War II saw the construction of airplane hangars and military facilities. Metal Quonset huts, which would later become ubiquitous as farm storage sheds, appeared. 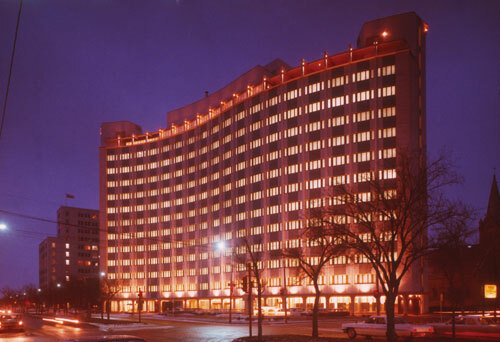 The Federal Building in Regina (1935) was one of the few large institutional buildings constructed during this period; designed by Regina architect Francis Portnall, it represents a transition between the “revival” styles of the previous decades and the Modernist architecture of the 1950s, 1960s and 1970s. Since 1945, architectural developments in Saskatchewan have paralleled those in the rest of the world. The province does not have an architectural school, and graduates who choose to return after their studies or move to the province from elsewhere bring with them an international perspective that they often combine with a keen sense for local materials and a particular way of engaging the prairie terrain. Between 1960 and 1980, Joseph Pettick, Clifford Wiens, and the firm Holliday-Scott, Paine designed buildings in the modernist style that combined international influences with local materials; examples include the Saskatchewan Power Corporation (Regina, 1963), the Silton Chapel (1969), and the Lutheran Seminary (Saskatoon, 1968). Recent concerns in the architectural community, related to sustainable design, energy efficiency and heritage conservation, have combined with a Saskatchewan tradition of utilizing substantial materials and engaging the landscape. “Post Modernism,” where historical forms are rendered in modern materials, and “Revisionist Modernism,” where a humanizing influence is brought to modernism, are two international developments that influence Saskatchewan architecture. Examples include the Saskatchewan Provincial Court (Prince Albert), the Alice Turner Library (Saskatoon), the T-Rex Interpretive Centre (Eastend), the Spinks addition at the University of Saskatchewan, and the First Nations University of Canada (Regina). Boddy, T. (ed.). 1980. Prairie Architecture. Prairie Forum, Special Issue. Regina: Canadian Plains Research Center.